This American Bully nicknamed Blue Jeans sold and went to a new family. 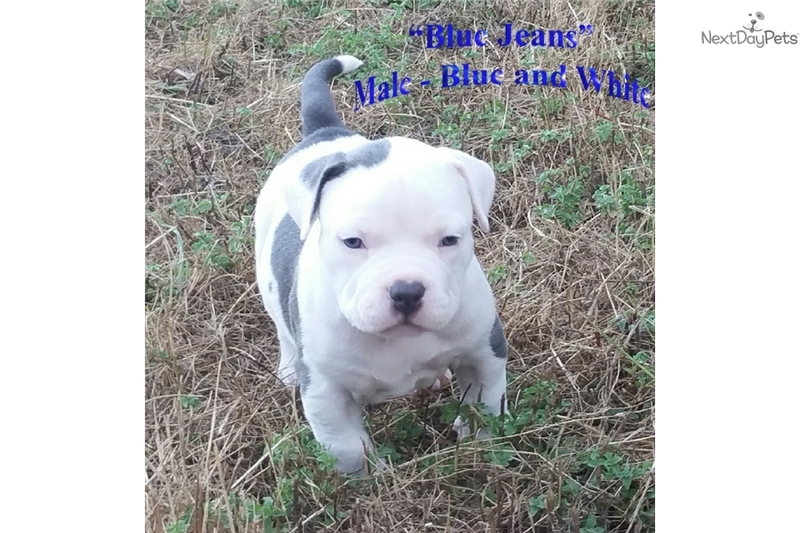 Holmes Ranch is Proud to Offer "Blue Jeans" a Male Blue and White American Bully pup born July 12, 2017. Heavy Bloodlines of Kurupt, along with Miagi, Kingpinline Marcello, Terminator and More. He sells with his Registration Application for both UKC and ABKC registration. He will be Current on all Age Appropriate Shot(s) and Wormer. Fed a Quality Grain Free Food. Air or Ground Shipping is available at additional cost to be paid by the buyer. Please Call or Text (541) 582-6531 for Complete Information and Details or feel free to visit our website at www.holmesranch.net directly for Complete Information, pedigrees, etc.